Learn wilderness survival or update your outdoor survival knowledge. we offer articles, graphics, pictures, tips, tricks, and other emergency disaster information. In today's uncertain world, learn wilderness survival to protect you and your family from natural disasters, terrorist attacks, or being lost in the woods. While wilderness survival is not difficult with the proper survival gear, it can be uncomfortable or even deadly if you do not have the knowledge needed to survive an emergency. We have provided on this site, at no charge to our visitors, wilderness survival articles, survival tips, survival tricks, wilderness survival information, and survival graphics to aid in your learning Wilderness survival skills. Our survival article source is a retired E-8, United States Air Force trained in the field of Life Support. He taught Wilderness survival. 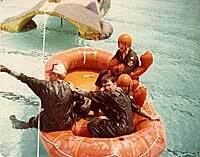 Gary Benton (no helmet or hat) looking at the camera while teaching Water Survival to aircrew members at Cannon, AFB, 1977. Site is owned and operated by Gary Benton, SMSgt, USAF, Retired. Gary spent over 12 years, of his 26 years, teaching survival and parachuting procedures as a Life Support Instructor. His second career on active duty was in the Industrial/Occupational Safety field as a superintendent. Learn endurance so during the next natural disaster or terrorist attack you and your family can live! Learn to live with a little survival gear or emergency disaster kits. Endurance is simple, using our skills, anyone can become a survivor! Use our information during your next outdoors project or real emergency and learn survival of the fittest! Use our information and articles to find food and water - save the food from your survival kits. Some of you may want a gun for survival and it can assit you a great deal. If you need help purchasing firearms, you can look into gun financing. Now Released! "Impending Disasters," how to survive natural disasters. We strive to provide you with the latest in information pertaining to the outdoors, natural disasters, terrorist attacks and much more. If it deals with an emergency, we most likely have the information. Be sure to view our "How to" series of Outdoor tips and learn how to survive or update your outdoor knowledge base. Our Goals - Simple Survival has information for emergency situations that may be encountered by hunters, hikers, fishermen, or others who enjoy outdoor recreation. Information about our book, "Simple survival, A Family Outdoors Guide," by Gary Benton. Note: These procedures are suggest for actual emergency situations and not for any other reason. The laws pertaining to taking of wild game varies from state to state and country to country, so don't attempted to procure game just to see if our information works. Contact me for autographed books. Emergency survival kits take knowledge to prepare and organize. Learn what should go into a kit and what you should leave out. Learn what is seriously need and what is just for show. Simple survival has the expertise to help you make or select a good kit. Learn to live comfortably in the woods. Simple survival gives you the tips to master the woods. Learn to live with survival knives and a little gear or with complete emergency disaster kits. Endurance is simple, using our skills, anyone can become a survivor! Use our information and articles to find food and save the food from your survival kits. View ebooks for Kindle, Nook, Apple iBooks, B&N, or Kobo. Ebooks were released 2 December 2012. WR Benton is a participant in the Amazon Services LLC Associates Program, an affiliate advertising program designed to provide a means for sites to earn advertising fees by advertising and linking to Amazon.com. © 2012 Simple Survival, All rights Reserved.